Jessica was wonderful to work with. She made custom invitations and related paper goods for my wedding. She sourced items, created samples for me to select from and worked under a very tight time constraint to complete my project. She was a great communicator throughout the project and the quality of her work is outstanding!! Thanks, Jessica. The Chrysanthemum is a symbol of the light of hope in dark times, as it blooms even into November. It's beauty is a wonderful reminder that the struggles of this world are just darkness waiting for a light to shine. 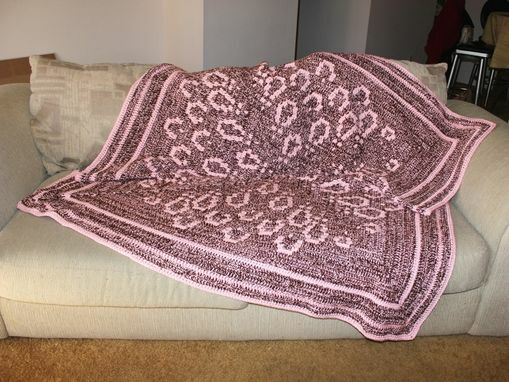 This afghan was designed and created as a donation to the FO(u)R WALLS benefit art exhibition sponsored the by the Iowa State College of Design. All proceeds from the auction supported a local homeless shelter in Ames, Iowa, the Emergency Residence Project, and a non-profit design firm in Delhi, Engineering Ministries International-India. This project on homelessness was focused on the story of hope, and all of the ways that art can portray hope in the middle of a broken and struggling world. This beautiful, warm afghan was crocheted using Caron Simply Soft yarn in Soft Pink and Chocolate. 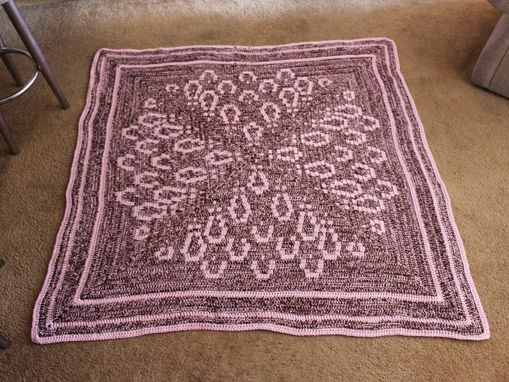 A special technique was used to crochet with both colors at once, as well as enhance the pink for the petals of the flower. Every maker has a story. Be a part of Van Eaton Crafting's story by placing an order, leaving a review, and seeing your review appear here.